PMU is the largest betting operator in Europe that offers sports betting, including horse racing betting, and poker on its website. At the occasion of the Prix de l’Arc de Triomphe (a famous horse race in Paris) that took place on October 1st 2017, @PMU_Hippique (PMU’s Twitter account dedicated to horse racing betting) went for a Twitter several steps mechanism to give its community the chance to win free tickets to attend the event. The social media team turned to Like a Bird to set up a StoryPly in 4 steps including a random draw at the end dedicated to the participants who won the fictitious race and retweeted the last step. The idea was to put yourself into the shoes of a jockey in a fictious horse race to qualify for the Qatar Prix de l’Arc de Triomphe #QPAT. To start the game, the participant had to RT the announcement tweet, which would maximize the exposure of the operation to the community. RT to qualify for the Arc de Triomphe, by competing in this race and have a chance of winning tickets for the #QPAT! The Mandatory Follow had been activated to send a message to non-followers participants to encourage them to follow the relevant account. If the participant did not become a follower, he would not receive the first tweet corresponding to the first step of the race. For each step, he had to choose between two actions presented in hashtags. What is the location number, to enter you stall, #six ou #sixteen ? The operation featured first person HD videos to illustrate each action that was chosen by the participants, giving the illusion to be into the shoes of a jockey and at the heart of the race. What will be your initial strategy? Do you prefer to go at the #head of the race or stay in the #pack? You are 200m away from the pole, make a choice between those two: #voice encouragement or #ridingcrop? 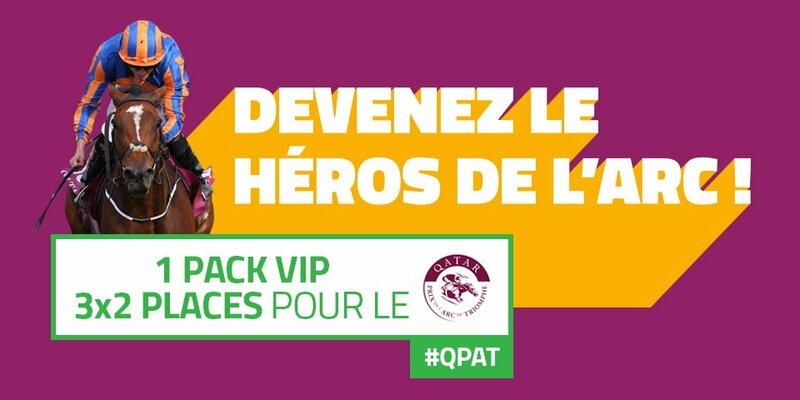 At the end, if the participant had the winning combination, he would get asked to RT the last step to become eligible to the random draw and have a chance to win tickets for the #QPAT. Congratulations for this place! RT and follow to participate to the random draw and have a chance to win tickets for the #QPAT! Do you want to have more information about this operation? Do you have a specific need but did not found anything to match it in our proposed operations ? Don’t hesitate to contact us and to test our chatbot on Twitter and Messenger to find the best operation that will meet all your expectations.